The Pa1000 sound engine uses four times the PCM memory of the best-selling Pa900 and extends the amount of User PCM memory to 600MB using compression. The number of User Style locations has also expanded to a maximum of 1,152 which will cover almost every style imaginable. The improved built-in speaker system produces a strong, full-bodied sound that’s enhanced by standard features such as the TC Helicon Vocal Harmonizer, a Dual MP3 player & recorder, and the Dual Crossfade Sequencer. Video output is standardized, so your audience can sing along to the onscreen lyrics. The Pa1000 packs all this in a high‐quality case with aluminium side-panels in an elegant chassis to provide a prestigious look on any stage! The Pa1000 has been designed with the concept of combining a slim profile with a professional motif. But while its size might appear compact, its sound is huge, thanks to the power of the onboard high-quality custom designed amplification system. The 2x33 Watt amplifiers drive the 4 loudspeakers in a bass-reflex enclosure to generate a rich, full-bodied listening experience. The main panel has been optimized to ensure that all controls are ergonomically positioned and intuitively located to make every performance feel smooth and natural. Big, bright, and bold, the new capacitive TouchView display hosts a redesigned graphical interface that is easier than ever to read, even under the most demanding lighting environments. The entire screen can be tilted forward and back to provide the perfect angle for optimum viewing—on stage or off! Searching for that Song, Style, or file that you were just using? The multi-function Search feature can find what you are looking for—quickly! 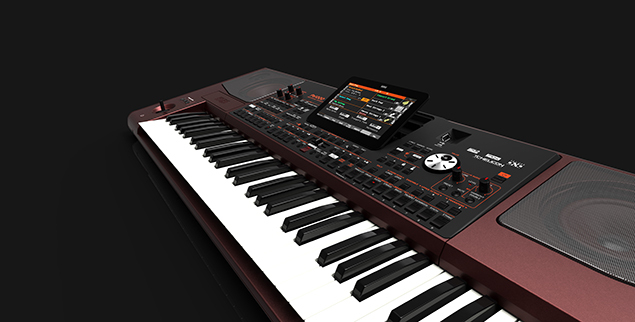 Styles, Keyboard Sets and SongBook can be read directly from a USB drive—without the need to load data in the internal memory. The Pa1000 relies on KORG’s advanced EDS-X (Enhanced Definition Synthesis-eXpanded) sound engine, and comes complete with over 1,750 ready-to-play sounds. This realistic collection offers a vast gathering of classic and contemporary keyboards, band and orchestral instruments, plus electronic and acoustic instruments—from techno to folk. Included are two new multi-layer stereo grand piano (with damper and body resonance), plus electric pianos from the acclaimed KORG SV-1 Stage Piano. The digital drawbar organ includes key on/off noises, leakage, and Rotary Speaker emulation. In addition, the Pa1000 has been equipped with new wind instruments, strings, basses—even acoustic and electric guitars. Sounds have been painstakingly captured using state-of-the-art methods that allow the finest of details to be accurately reproduced. Three assignable switches and the four-way joystick allow KORG’s unique DNC (Defined Nuance Control) to reproduce the subtle nuances and articulations of acoustic instruments creating ultra-realistic performances rich in expression—all in real time and on demand. Bring any solo or melody to life with the growl of a passionately-played saxophone; the changing embouchure of a trumpet; the breath elements found in a clarinet or harmonica; and the added characteristics that give extra authenticity to the pizzicato and arco sounds of a string section. 107 authentic drumkits—including Ambient Drums—breathe life into any rhythmic passage; the Drum Family Easy Editing feature offers total control over volume, pitch, EQ, and more. Up to 600 MB (compressed PCM User memory) are available, so custom sounds can be added easily. The General MIDI (GM) sound bank has been improved for better compatibility with GM files. 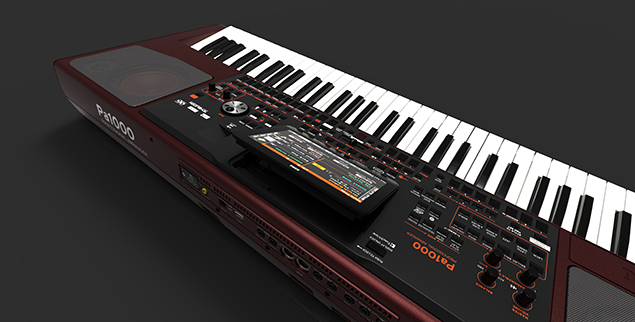 The Pa1000 can also load/import KORG, WAV, AIFF, SoundFont™ formats and export in WAV or AIFF. Sounds can be fully edited, and can now use up to 24 oscillators for each note! The Pa1000 delivers over 430 Styles, straight out of the box. Each one is a fully-realized musical environment dedicated to creating a particular musical style. With so many to choose from, the Pa1000 can provide instant access to a vast and robust range of musical genres. Each Style features 4 Fill Ins + Break patterns, one for each variation. Using the new Auto Fill function they can be automatically recalled as you move between the four variations. Our international sound team has created many new Styles; and many of our revered and well-known Styles have been improved with new sounds and new mixing. The Pa1000 has 1,152 user locations for you to save your new Styles and settings. Several new sophisticated parameters which ensure professional and realistic guitar tracks have been added with Guitar Mode 2, making the guitar tracks of every Style rich and authentic. In addition, each Style can be enhanced by using the four Pads. Each Pad can add a one-time or repeating riff, a percussion part, an accent sound, or even a sound effect. The convenient Chord Sequencer function can quickly record and loop your chord progressions on the fly in Style Play mode; this can be useful not only for practice, but for freeing up your left hand while performing live. These Chord Sequences can now be also saved as Style and SongBook entries for easy recall. 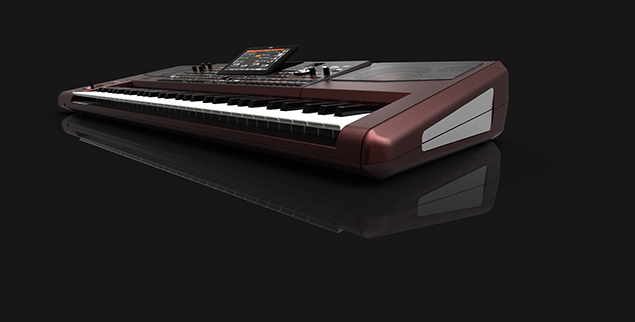 KORG is known for studio-quality effects, and the Pa1000 includes the best of the KORG library. 2 Insert and 2 Master effects can be used for the accompaniment tracks, while 1 Insert and 2 Master effects can be used for the real-time keyboard tracks. 148 effect types are available, including reverbs, delays, vintage stomp box simulations, amp and cabinet simulators and more. In addition, each track features an EQ with Low, Mid and High controls, and a custom track EQ can be memorized in the Song Play mode—allowing your song to sound its best in any environment. The final effects allow for easily adapting the sound to your musical taste or correcting a problematic live scenario. * To ensure professional vocal performance, 2 knobs and 3 buttons controlling the most important vocal functions have been added to the top panel within easy reach. The famous KORG XDS Crossfade Dual Sequencer Player supports the MP3+G (also known as MP3+Graphics) format for MP3 files in addition to the most popular lyrics formats. This new feature allows backing sequences to play with enriched lyrics and graphics which can be displayed simultaneously on the on-board TFT display and on an external monitor. There is also a Marker Function, allowing direct jumps to a given position in the song. Two different MP3 or MIDI files can be played simultaneously and both MIDI and MP3 files can be transposed, accelerated or slowed down. The Vocal Remover allows vocals to be removed from MP3 files using a center-channel cancellation tool. The 16 track sequencer allows sophisticated levels of sequencing, but also provides quick and easy song creation using the Backing Sequence function. And because the Pa1000 is very clever, it can record your entire performance! You can run a song, play the keyboard, sing along and everything will be recorded in MP3 format and stored on an external USB device or in the internal memory. A sophisticated Score Viewer is also available to display the lead track (or any other track) of a song as clear and plain traditional musical notations with notes or chords, together with lyrics and chord abbreviations. Chord names can also be seen both in English and Italian. For those learning music, we also added a function to show note names next to each note. Particularly useful for live use, the SongBook is a fully programmable and easily searchable Music Database. Each entry contains all the settings required to play a particular song. The SongBook can use styles, MIDI files or MP3s and immediately recall settings such as song title, genre, artist, tempo, volumes, sounds, muted tracks, FX settings, easy edit, 4 Keyboard Sets, TC-Helicon® presets, master transpose and more. The SongBook includes also a renewed Set List function, with a convenient panel-button association for fast recall, to make life easier during live gigs. With the SongBook Editor you can easily view, create, and edit your KORG Pa-Series SongBook entries and Set Lists using a Windows based computer. It can also be synchronized with iOS and Android tablets to become your handy external digital music sheet reader (third-party software required). Everything you need to play your song back perfectly is in the SongBook, a useful musical feature that is unique to KORG. Voice Processor: EQ, Compressor, Gate, DeEsser, 3-voice Harmonizer (or Double), 2 x FX. (W x D x H): 1030 x 378.3 x 133 mm / 40.55" x 14.89" x 5.36"